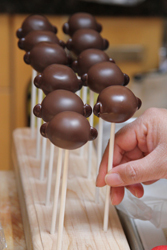 A few weeks ago, our cousin asked if I could help make some cakepops for his first baby’s birthday. This of course was a super special event for ALL of us, so I happily agreed. The birthday girl was going to be one year old, and of course this was not going to be just any birthday party, but her first! It had to be special! 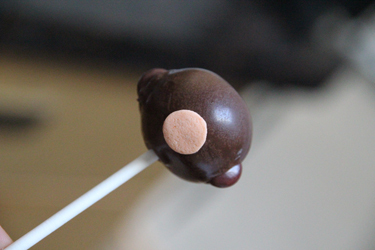 I told my cousin I’d be more than happy to make cakepops for the party, and that the cakepops would be my gift to her. I was used to making cupcake shaped cakepops, so this seemed pretty doable … until I was asked if I could “do animal shapes?” … aack! I’d never done animal shapes before! But I figured I could put something together. 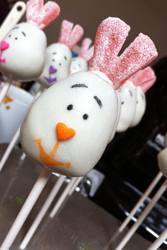 I did have a cakepop book and consulted it for the lion, monkey, and bunny shapes that were requested. 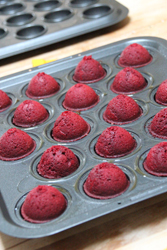 With such a large amount of cakepops needing to be made, I tried using a shortcut with a “cakepop baking pan” that lets you bake cakeballs instead of having to bake the cakes, crumble them up, and mix them with frosting. 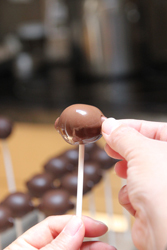 I’d always thought cakepops are a bit sweet anyway, so the idea of it just being cake inside instead of having the frosting mixed in as well appealed to me. 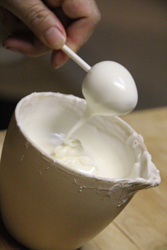 Too bad for my purposes, the cakepop pan SUCKED! I was going to have to do this the old fashioned way. Ha! 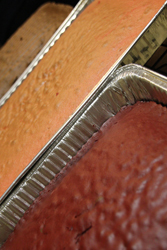 I baked double-sized chocolate, red velvet, and raspberry cakes. 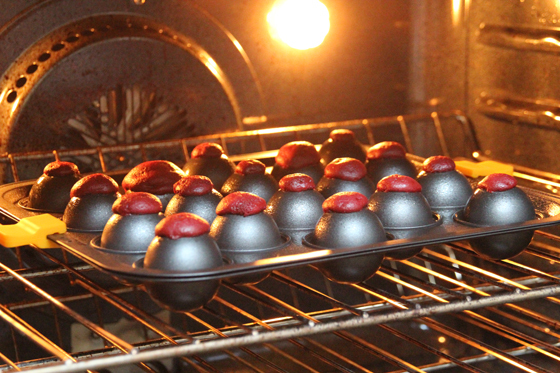 One by one, they went into the food processor to get crumbled, and I mixed them with frosting, then rolled the cakeballs. 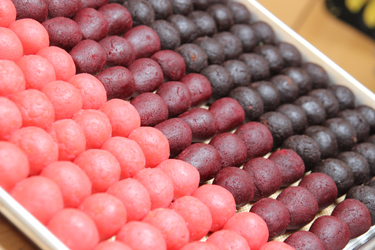 A LOT of cakeballs. They were really colorful – beautiful! Like something out of Willy Wonka’s chocolate factory. 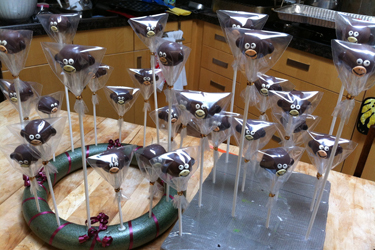 On Monday, I made my first animal shaped cakepop. A chocolate cake lion with a mane of peanut butter morsels and a Reese’s Pieces nose. So cute! 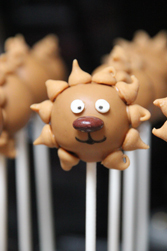 With the lion design done, I had more confidence that I’d be able to get this cakepop safari together. 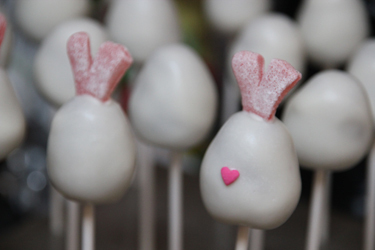 Next, I made red velvet bunnies in vanilla coating. I was concerned about the ears because the book called for “pastel candy corn” and yeah, where the heck was I gonna find that? 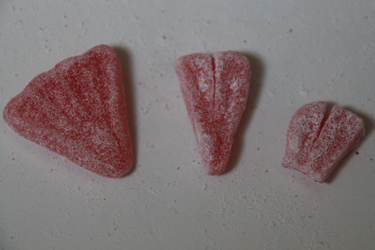 Mom and I visited a candy shop in Burlingame and found pink grapefruit sour candies that looked like they’d do the trick. I altered the design from the original a bit and drew the faces on after seeing this cute style online. Adorable! 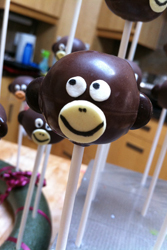 Finally came the raspberry cake monkeys dipped in chocolate with M&M ears. These are so silly. And delicious. Their eyes are again white candy confetti, like the lions, and their proboscises are jumbo candy confetti, which I had never known existed until I had to make these guys! Although this was a crazy amount of work, seeing these adorable figures take shape and get their own personalities was a lot of fun. 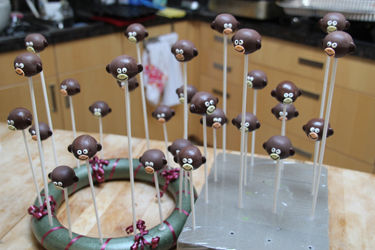 Glad I made those wooden cakepop holders – I made about 75 of each of these guys! Putting the wrappers on the monkeys reminded me of the part in Nick’s favorite movie, “Fight Club,” where the guys are shaving their heads and Brad Pitt calls them “Space Monkeys, ready to be shot into space!” Ha ha ha! After everything was done, I put all the cakepops on display so I could revel in my week’s work. This was cool. I am so happy to have been able to do this – what a great birthday party this will be (other family members are doing a lot of awesome stuff for the party too!) 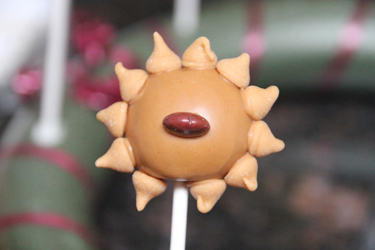 and I’ve also gotten to learn a lot about creating different looks with cakepops. I hope the birthday girl has a super fun day, and that Mom and Dad take home wonderful memories.